Up until not long ago mortgage rates used to be very low, close to the lowest they have ever been. Rates have decreased to near record lows due to the recent housing market crash, which affected both homeowners and mortgage lenders. While millions of people have lost their homes to foreclosure, lenders have also suffered losses and were forced to reduce the interest rates on mortgage loans. Even if interest rates were very low, few people could afford to buy a home until recently, when the economy has started to improve. With the economy improving, the housing market has started to recover, and homeowners are showing more and more interest in purchasing homes. An improving economy means that the demand for homes increases, so interest rates also go up. Interest rates are still fairly low, but have increased significantly lately, and it looks like they are going to continue to do so. Home buyers who are waiting for mortgage rates to go down again may be waiting in vain, and should hurry up and make a purchase before rates go even higher. That doesn’t mean that you should go ahead and buy a home if your financial situation isn’t ideal for becoming a homeowner. Waiting might be a better choice, even if interest rates continue to rise. Buying a home when you are not ready can result in having to pay a larger down payment, less favorable terms, or even a higher interest rate. 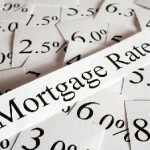 Mortgage rates are very complicated, they depend on a variety of factors, and forecasting them is close to impossible. However, there are certain things that one can look at, in order to get an idea of where interest rates are going. When interest rates have been steadily increasing or decreasing for a longer period of time, predicting what will happen to them in the near future becomes easier, but it is never a hundred percent accurate. Here are some of the factors which can allow you to tell if current interest rates are going to continue to rise. Consumer demand. When there is very little demand, as it happened during the economic crisis, lenders are suffering and so they do their best to attract customers. By decreasing interest rates, mortgage loans become more attractive, so they get more customers. Currently, most industries are recovering, which means more and more people find jobs, so the demand for homes is rising. Like with any other market, the higher the demand, the higher the prices. The housing market is no exception, so it looks like, as long as the demand will keep rising, so will the interest rates. Availability. Even if the homes demand is high, the homes availability can slow down or put a stop to increasing interest rates. If homeowners are not selling, fewer homes become available. This means less new mortgages, so the interest rates go up. If more homeowners are selling, the availability increases, and interest rates go up. The economic health. When the economy is doing great, lenders see it as an opportunity to make more money, so interest rates are increased. A good economy means that people have more money to spend, so interest rates go higher. The United States economy keeps improving, so we will most likely see mortgage rates go even higher. The Federal Reserve. The Federal Reserve has a large influence over mortgage interest rates, among others. Besides controlling interest rates, the central bank also controls how much money each bank has and how much it can lend. When the bank reserves increase, interest rates go down in an effort to attract customers and stimulate spending. When Federal Reserve policy decreases bank reserves, interest rates are usually increased. All these factors indicate that current interest rates will continue to rise. The economy is strengthening more and more as the time passes, people are finding jobs or need to move to a different area, so the demand for homes also increases. With the exception of some unforeseen incident, like a new war or economic collapse, the mortgage rates will most likely continue to increase for a while. Keeping an eye on the factors listed above will definitely help you tell if current mortgage rates will continue to rise or start going the other way.